Get hardscapes built in Nashville TN areas. Get stonework performed in Nashville TN areas. Get pond / waterfall help in Nashville TN areas. Get drainage help in Nashville TN areas. 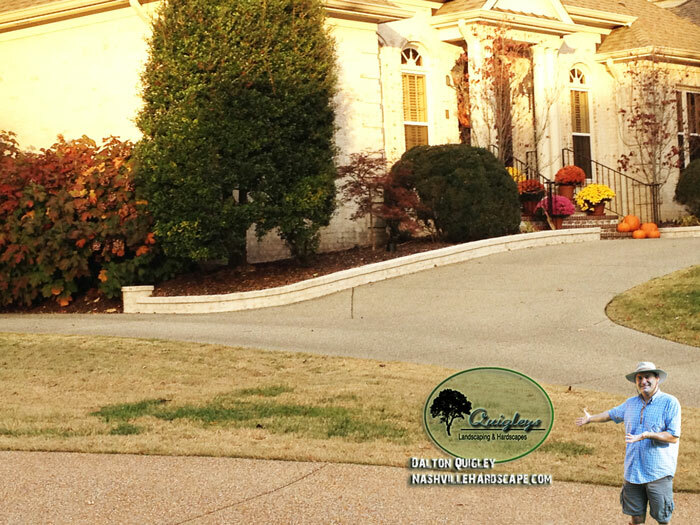 Get a lawn care service in Nashville TN areas. Get a deck or fence in the Nashville TN areas. Get outdoor landscape lighting in Nashville TN areas. Get sealing for decks and driveways in Nashville TN areas. Get irrigation help in Nashville TN areas. Buy topsoil in the Nashville TN area. Buy sod in the Nashville TN area. Buy stone for your outdoor projects in the Nashville TN area. Buy pavers for patios in the Nashville TN area. Buy nursery plants in the Nashville TN area. 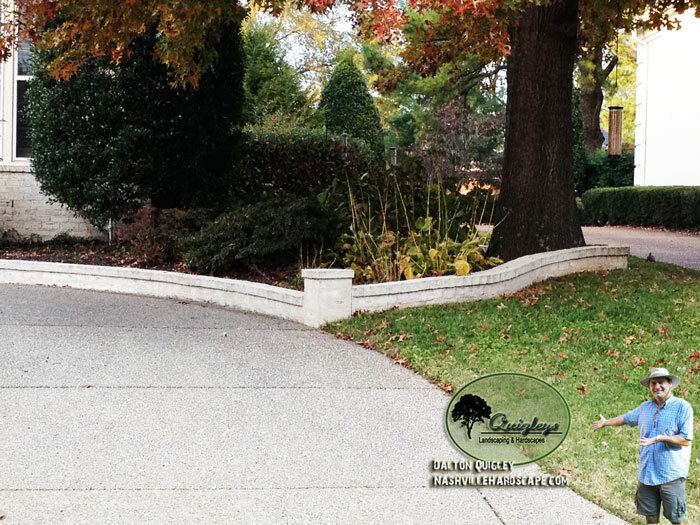 The images below are an example of a brick garden / landscape border we installed in the Nashville TN area. Brick Garden Border approximately 10″ to 12″ tall. The brick garden border adds a stately elegance to any home. The example of a brick landscape border has columns on each end. Most of the projects we perform involving landscape edgings include, iron garden edging, dry stack looking garden borders, and brick garden walls. The image below follows the gentle curve of the landscape and driveway. Get in touch with us today to have your brick garden border installed. 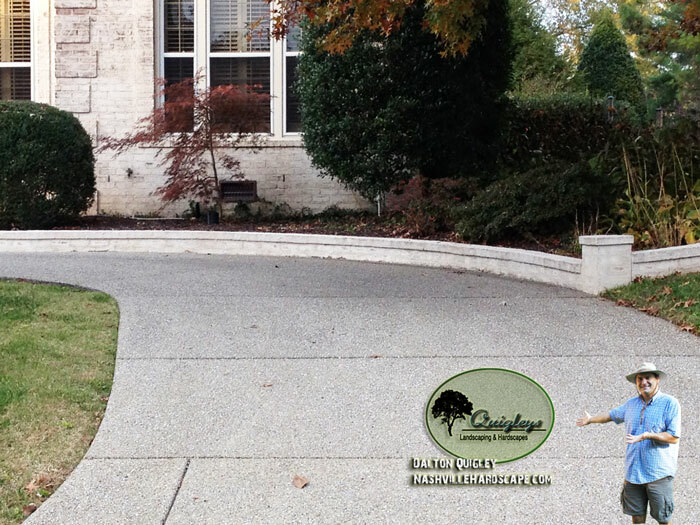 We perform work on garden / landscape borders and edgings in Nashville, Brentwood, Franklin, Spring Hill, and Nolensville Tennessee. Click Here Now for to contact us your Brick Garden / Landcape Wall! See the Techo-Bloc Hardscape Show. You have got to see what Quigley has found! Stonework and mason estimates for the areas of: Nashville, Brentwood, Franklin, Spring Hill, Nolensville, Smyrna, Murfreesboro, Tennessee areas.. with Stonework, Masonry work, hardscapes, patios, walkways, walls, columns etc.